On the back cover of Lumpy Gravy, Frank Zappa asks, via word balloon, “Is this Phase Two of We’re Only In It For the Money?” It’s a fair question. Though Lumpy Gravy was intended as an avant-classical piece, the approach follows Money‘s collage aesthetic. Incorporating studio chatter with the orchestral snippets of music makes for an interesting bit of musique concrete, but without the satirical bent of his rock work. The concept of the album is that it features a society living in a piano. The conversations are all taken from the piano’s denizens. (In the recording, Zappa just asked the people to improvise conversations based on various topics he threw out — after noticing that if people spoke near the studio’s piano, the strings would reverberate.) The story, if there is one, is a bit muddled; the main idea in the spoken parts is the idea of “the Big Note,” sort of a musical take on the Big Bang theory, that atoms continue vibrate from the original “note.” There’s also chatter about “pigs and ponies” (two different types of people), a snippet of Wild Man Fischer’s “Merry-Go-Round,” nationalism, and, well, whatever else. Frank Zappa’s Lumpy Gravy is either his third or fourth album, depending on how you count. We’re officially counting it as the fourth album — the “official” ordering — placing it after We’re Only In It For the Money. But actually, Lumpy Gravy was released in a drastically different version about a year before Money. 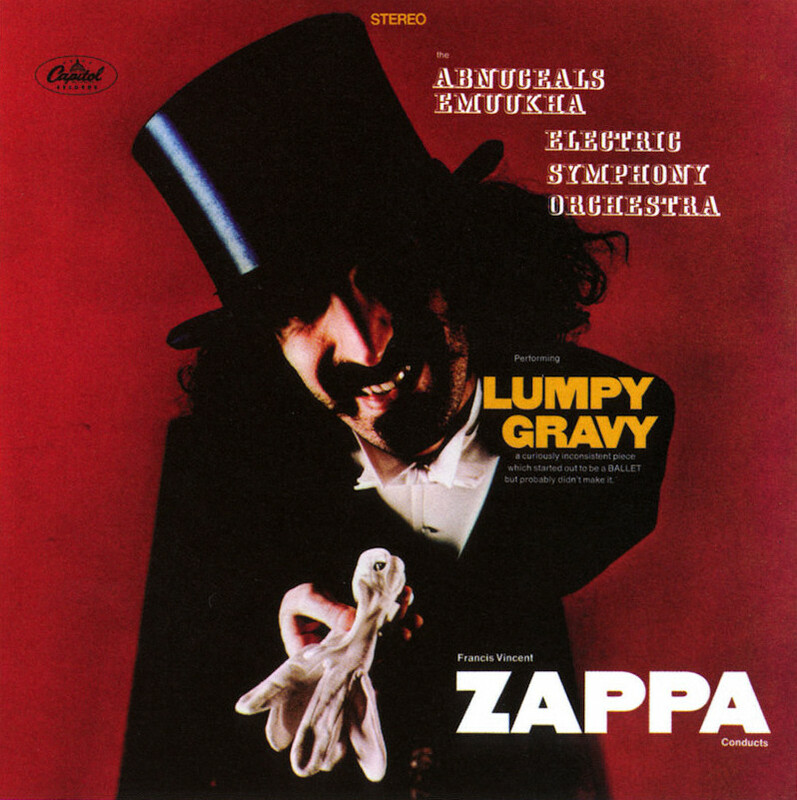 Capitol Records commissioned Lumpy Gravy for their classical label, and even briefly released it. Zappa’s label at the time, Verve, said that it was a breach of his contract, as he wasn’t allowed to perform for any other label. Zappa argued that he hadn’t breached the contract as he, nor any of the other Mothers played on the album. He merely composed and conducted, and Verve didn’t sign Zappa as a conductor. The argument didn’t work, and the Capitol Records version of the album was withdrawn. Zappa went back to the studio and remixed and reworked the album for Verve, and released it as the follow-up to Money, as part of his “No Commercial Potential” trilogy, which also included Cruising With Ruben and the Jets. The Capitol Records version of Lumpy Gravy. This photo was used for the back cover of the Verve edition. Though lost for years, the Capitol version of the album was released on Lumpy Money, a 3-CD compilation of rarities and work tapes around Lumpy Gravy and Money — as if the title didn’t make that obvious. The Capitol version of the album is only 22 minutes long (the remix added another 10 minutes), and features just the orchestral parts. Honestly? I actually prefer this version to the official version of the album. Though the chatter on the Verve Lumpy Gravy is brief, it points to Zappa’s tendency to think the rest of us will find his band as fascinating as he does. We’ll get into that more with Baby Snakes and how the 3-hour film is basically a 90-minute concert weighed down with 90 minutes of screwing around and in-jokes that I’m sure are hilarious if you were there. Sadly, this tendency completely sinks the Lumpy Gravy sequel album, Civilization Phaze III, a 2-CD album of dreary synclavier music laden with dull piano people chatter that goes on forever. The chatter on the original album works as well as it does because it’s mercifully brief, making the album feel like a document of recording the album. Civilization Phaze III goes more into the world building, and, well, just like I didn’t care about the blow-up doll in Baby Snakes, I don’t care about the folks in Civilization Phaze III. One final bit of trivia: The original pressing of this album credited it to “Francis Vincent Zappa,” which Zappa believed to be his full name. Later, however, he found out that his birth certificate did, indeed, read “Frank Vincent Zappa,” and thus the artwork was changed.